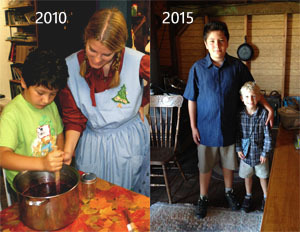 Go back in time and help on the pioneer homestead! Summer Camp is all new this year due to our new location in a historic house! 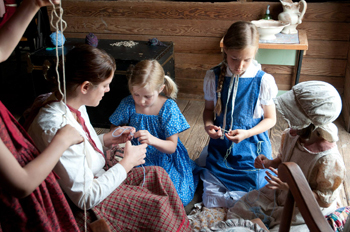 Learn all kinds of hands-on crafts and chores, like sewing, weaving, butter churning, grinding grain and more. 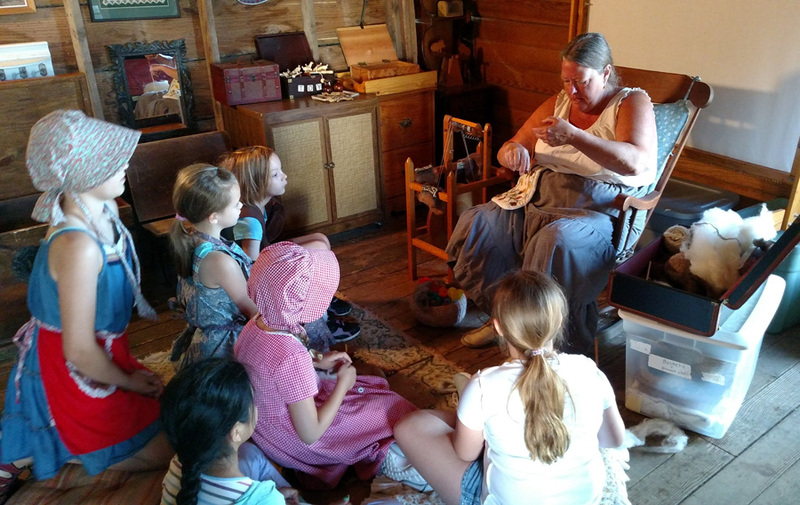 Enjoy visits from special guests who will teach us, trade with us, or share stories. 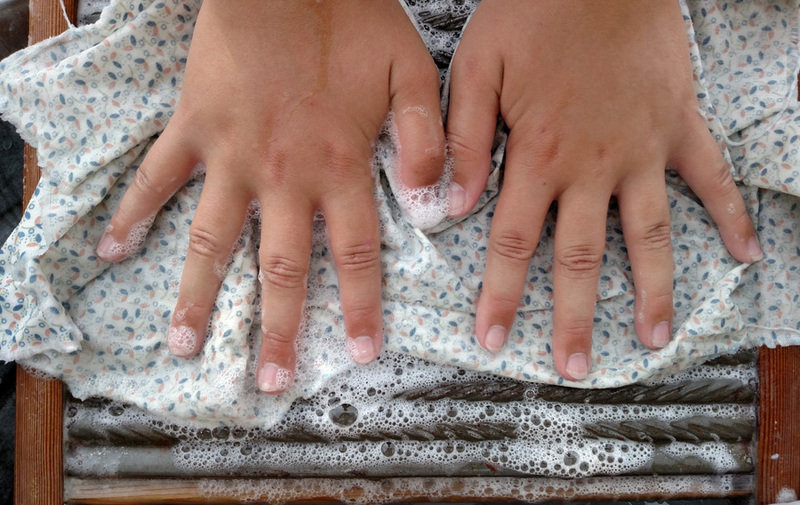 Have an old-fashioned school lesson, explore the river’s edge and more. Read about the values children learn in our summer camps. 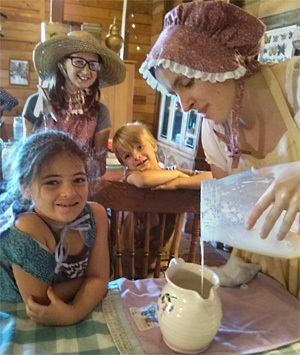 Lewis and Clark Summer Camp will be on August 19 – 23rd. This will feature exploration, mapping, nature discovery, learning about Native Americans, crafts, songs, games and trading. See below for details. Camps are Monday- Friday, 9am to 3pm, for children ages 6 to 10 years. Boys and girls are welcome. The house is not wheelchair accessible at this time. Children bring their own lunches and water bottle each day. Cost is: $215 per week, sibling discount available. We hope to be able to offer some limited scholarships again this year, please contact us for more information. Location: NOTE our new location this year, we are at the Snapp House in Cottage Grove, Oregon. See our About page for details. Please consider signing up early. The camp limit is 10 kids and they fill up quickly. Registration will begin in March. WAITING LISTS can help you if the camp of your choice is full. Request to be on the wait list by using our contact form on this website. Spend a week on the Lewis & Clark expedition! Be a part of the Corp of Discovery and go back in time to 1805. 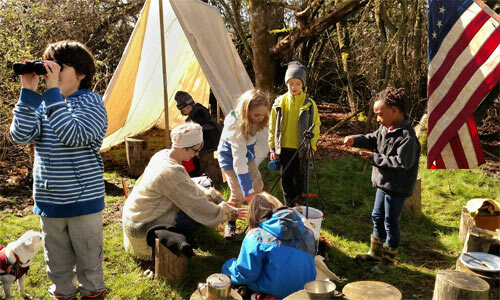 Learn how to make cordage out of nettle fibers, learn how to strike a flint and steel, track animals, make your own journal, learn to use a compass, meet some fur trappers, set up camp, explore the river’s edge and more! 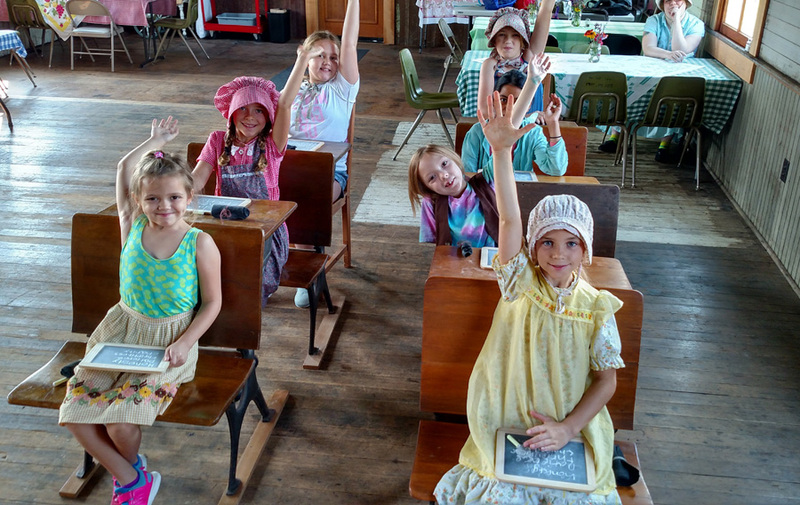 This camp is perfect for kids who have already done our pioneer camps and want a new experience. We’ll have costumed interpreters come to the camp to share their wisdom with us, like Hudson’s Bay Co Trappers and more. Write a letter to President Jefferson about your discoveries, “cache” some extra supplies for some of your group to find, and do some trading of supplies. Learn some Chinook “wawa” – trade language- and explore the journey from the perspective of Seaman, the dog who went on this voyage of discovery. This camp includes lots of outdoor time; dress accordingly. 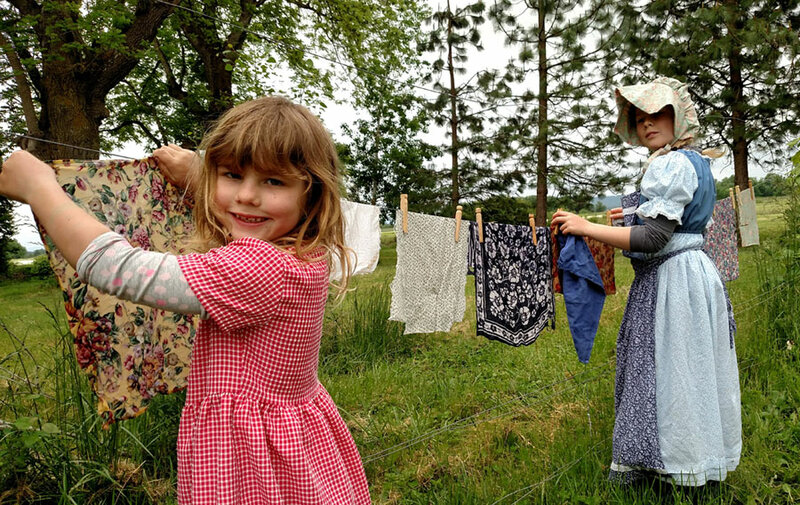 We always have some dress up clothes on hand to get in the style of the 1800’s. 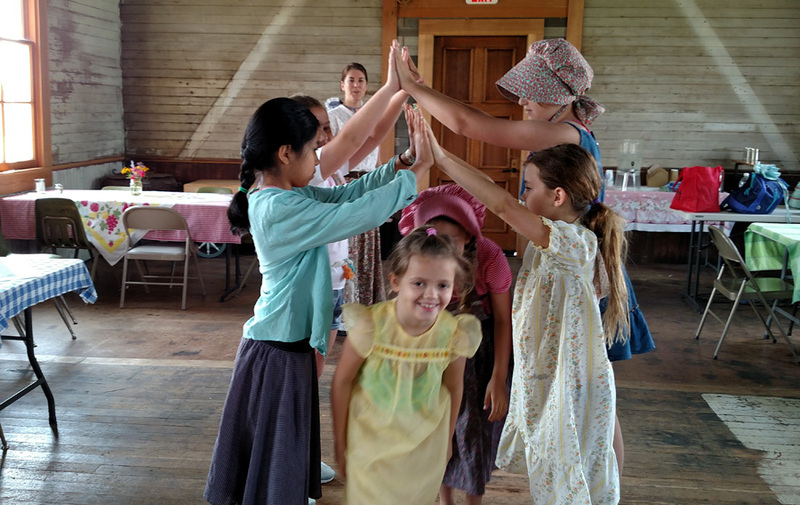 GIRL SCOUTS: This camp is suitable for earning your “Playing the Past” badge! 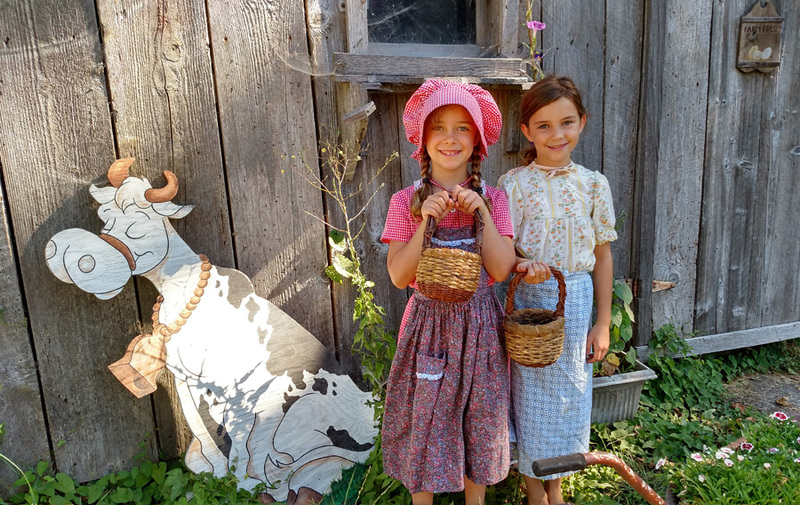 Our theme is pioneer homesteading, as in the books “Little House on the Prairie.” Each day will provide some structured learning activities, arts and crafts, and play time. 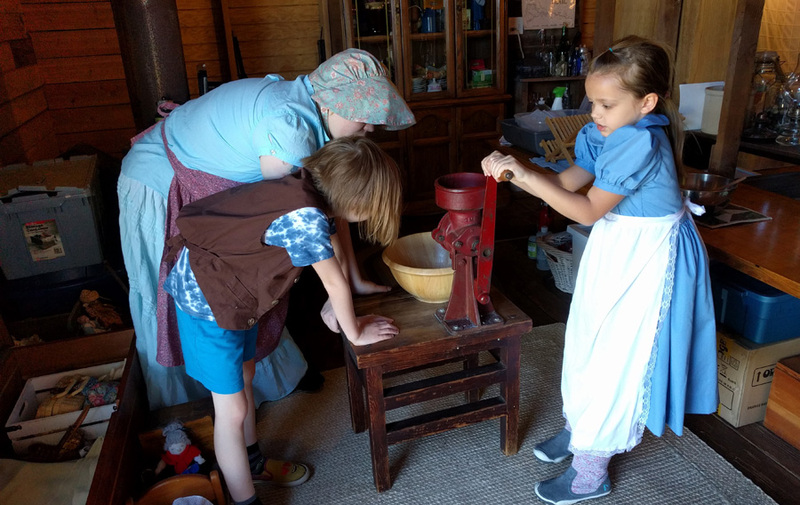 Some of our favorite activites are: sewing, playing school, churning butter, grinding grain, washing clothes on the washboard, making herbal medicines, and learning pioneer games. 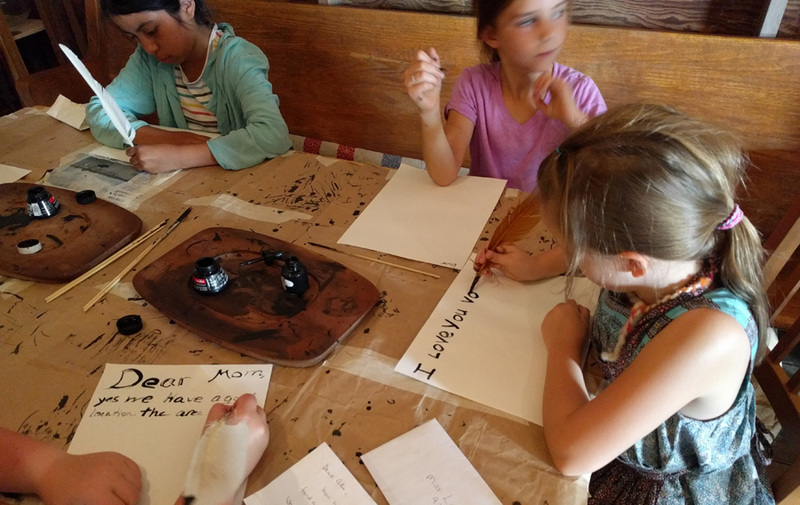 See our blog post about the “letter writing” component of camp. After you register you will get a more detailed explanation of our schedule, policies and more. We welcome kids ages 11 and up as helpers to the camps. You must have experience helping with younger kids (such as at our camps or another camp.) Junior helpers are expected to come 15 minutes early and stay 15 minutes late to help with set up and clean up. They assist with crafts, games and activities and are also doing the activities themselves. This is a really fun way to enjoy the camp but also gain work experience and be part of a team. The cost is $190 per week. Watch videos from past summer camps on our YouTube channel. A $30 non-refundable deposit is required to hold your space when you register. Please make checks payable to Singing Creek Educational Center. More questions? 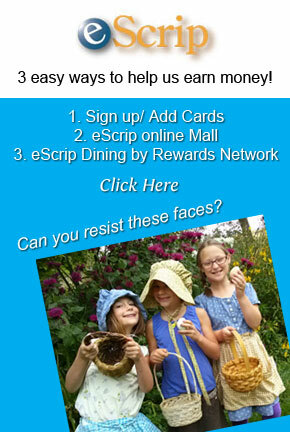 Check out our FAQ’s page. The remainder of your camp fees are due two weeks before camp starts. We will send out reminders to parents which will include schedule for the week, camp regulations, and checklist. Remember our mailing address is different than our site address! Please consider adding yourself to the waiting list if a camp is full. Sometimes last minute cancellations happen and we may have a space open. Contact us for more information about waiting lists. Deposit of $30 is non-refundable. Up to 14 days before the first day of the program you may cancel your child’s enrollment and receive a refund (minus the $30.00 deposit which is our cancellation fee). Cancellations made less than 14 days before the first day of the program will not be refunded. Registrations and fees are non-transferable.